In the past decade, 1 billion square feet of warehouse space has been built. While this seems like a shocking amount of space, in reality it only makes up 11% of total warehouse space available. That means that the other 89% of warehouse space was built in a time that pre-dates e-commerce—in fact, the average age of a warehouse is 34 years old. This results in spaces that are lacking in height, dock doors, amenities for employees, and even parking; however, have is the right centralized location. One warehouse that aims to be a solution for e-commerce is Quiet Logistics whose clients include Zara, Bonobos, Glossier, and M.Gemi. Located in Devens, MA, which is more than hour outside of Boston, they decided to forgo the location and capitalize on new advancements. Built following the e-commerce boom, the warehouse meets the architectural specifications like high ceilings and large dock doors that favorable e-commerce warehouses have and has cutting edge technology. With Locus Robotics, Quiet Logistics has developed robots that make the order fulfillment process as efficient as possible. Equipped with sensors, cameras, and light detection and ranging, the robots know their way around the warehouse is the most efficient way. This means they are tasked with going from zone to zone and quickly locating and delivering items to the human pikers complete and package orders. Together, the robots and workers each play to their strength and make a perfect team. Last summer, I interned at M.Gemi, a client of Quiet, and to got visit the warehouse to see it all in action. It was amazing to see how efficiently everything was run. I watched robots would zoom down the aisles and bring items to small areas where a group of 10-15 workers would package it. On the other side, I have also received items from clients of Quiet and always amazed by how fast my order comes. I’m sure everyone has ordered something online, only to wait more than a week for it to arrive. This is not the case with orders coming from Quiet. Packages usually arrive in two days, which is a direct result of the up-to-date warehouse and efficient technology. ← Dayton, Ohio? Really? Really. What an exciting experience that internship must have been! As you mentioned Quiet’s ability to rapidly fulfill multiple orders simultaneously, it reminded me of an unfortunate online shopping experience that I had. I had ordered a personalized item which needed to be assembled before delivered to me. I expected a decent wait as custom items often require additional time but after 3 and a half weeks of waiting I was getting impatient. Finally at the end of the third week a package appeared at my door. To my chagrin, the product inside was not mine. They had sent me the wrong package after nearly 4 weeks of waiting. Disappointed, I contacted customer service and got the situation resolved (after another lengthy wait). This really impacted my perception of that company and I have avoided purchasing from them since then. That really emphasizes the importance of an efficient, and accurate, supply chain process to ensure customer satisfaction and retention. Thanks for your post! I frequently shop online but I never think enough about the logistics of where my item is coming from. I typically use sites like Revolve which offers free two-day shipping to its customers. I order from them both when I’m at my parents home in Rhode Island or at school here in Richmond. My items always come promptly within the two days so I know if I ever need a last minute item of clothing I can get it easily. Your post on warehousing in the e-commerce age made me want to examine how companies like Revolve or Asos warehouse. Revolve is an example of a company that has acquired its primary vendor in order to streamline its supply chain. They acquired Alliance Apparel Group which gave them access to warehouses and to brands which allows them to be able to order inventory faster based on what is selling. In the above article about Asos, it mentions that Asos is able to fulfill 20% of its US orders using its Ohio warehouse. They have been able to do this by implementing transportation management systems. This way they can save on warehousing costs and instead allocate resources to achieving efficient transportation. Assuming most items need to be taken outside a 50 mile radius of their warehouse, it makes way more sense to have fewer more efficient warehouses and instead figure out ways to cut down on transportation time and costs. Asos has been able to implement systems that allow customers to know exactly where their package is at all time. This has improved both customer satisfaction and efficiency. The implication of automated inventory systems and e-commerce is changing the retail environment of today. When thinking about a disruptive and new company making an impact within the own industry by doing this, I think of the clothing company, Bonobos. Last year the company was purchased by Walmart for more than $300 million dollars after being founded more than ten years prior. The business was started by a passionate MBA student, Andy Dunn, who has since gone on to start his own private equity firm while remaining the CEO of Bonobos. The premise of the company was to develop better pants for men and grew dramatically due to their e-commerce platform. As one of the first men’s clothing companies to focus so directly on their customers, they took a holistic approach to selling and the design of their product. In addition to a well-designed product, they drew their customers in with their customer-focused sales and customer service strategy which was rooted in free 2-day shipping anywhere in the country for all of their clothing, no matter the size of the purchase, and free returns with two-day shipping. They focused on the convenience pitch to their customers allowing them to order as many sizes and types of clothing as they wanted, eliminated the need to go to a store, and then allowing them to ship it all back for free. This helped the company grow dramatically and create an efficient value delivery network and supply chain. Thank you for your post and the comments you made within it! 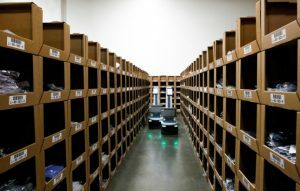 Warehouses in the e-commerce age are such an integral part of business for some companies, so this experience you were able to gain over the summer sounds incredible. I completely agree! There is nothing worse than having to wait a long time for a package you order, and there is no better feeling than seeing it arrive only a day or two after you place the order. To be able to achieve this, the company’s warehouse has to be working as efficiently as possible. Without a lean system in place, timely deliveries are tough to achieve. One factor that contributes to companies being able to have lean systems operating inside their warehouses is having new technology and easy access. As you mentioned in your article, the average warehouse age is 34 years, which is obviously tough because they are clearly not up to date. In the picture you posted for this blog, you can see that the warehouse has a very distinct and organized layout. This is not the case for the majority of warehouses. The article attached to the bottom of my posts actually states that a poor layout is one of the top five problems in more warehouses. The picture you’ve shown is ideal but is not the norm. Unfortunately, a poor facility layout is relatively difficult to overcome since most warehouses are so old and their structures aren’t ideal for a modern-age warehouse. The easiest, but probably not most feasible way, for most companies to fix this problem is to build their own new warehouses so they can design it and set it up in the most efficient way possible for their operations. Your post reminded me of an interesting article in the WSJ earlier this year. It was interesting to compare the article to your post, because, when combined, your post and the WSJ article provide two different sides to warehouse location argument. The article details how property developers and asset managers are teaming up to build mega-warehouses in New York City in order to meet the rapidly changing landscape in transportation in logistics. The article details two planned projects: a 370,000 sq. foot warehouse in Brooklyn and another 840,000 sq. foot facility in the Bronx. (For some perspective, a football field is about 57,000 sq. feet.). These projects represent a rather new trend in warehouse development. According to the article, warehouse development has mostly taken place in New Jersey—i.e. further away from customers like the Quiet Logistics warehouse. However, as customers demand for speedy delivery continues to accelerate, two and even one-day delivery doesn’t cut it anymore—customers want their products within hours of ordering them. A recent McKinsey report estimated that 15% of “last-mile” volume (i.e. deliveries from warehouses extremely close to customers) would come from instant and same-day delivery services by 2020 (WSJ). As firms adapt to this trend, demand for “last-mile” facilities has increased drastically. Furthermore, firms have financial incentive to develop supply chain locations extraordinarily close to customers: the same McKinsey report estimates that, on average, 50% of the delivery cost is associated with the last-mile shipping costs. If this estimate is accurate, the potential to drastically reduce delivery costs could justify the larger up-front capital expenditure to operating warehouses in places like New York City. It was also interesting to tie some of the points you made to points in the article. For instance, you mentioned that many of the old warehouses that are close to customers—and can likely be considered “last-mile” facilities—are out of date and unable to support modern e-commerce business models. The article mentions that many old facilities in New York City match this description. Therefore, it is understandable why developers are interested in building widely expensive warehouses in these locations: the combination of proximity, proper size requirements, and modern technology would be in hot demand with retailers looking to gain an edge (greater speed and reduced costs) over competitors. Caroline, I think you have written on a topic that will become ever-more important in the coming decades as brick and mortar becomes less and less prevalent and e-commerce takes over. Nicholas posted on location this week, and I think both his and your topic are good leads into questions that we will have to answer in the future. Will decisions regarding warehousing and storage have to be outsourced or will constructing your own be the best bet? I guess we’ll know as we progress. What are everyone else’s thoughts? Thanks for your post, Caroline! I had no idea that the inventory for brands like Zara and Glossier were managed by the same company. This was especially interesting to me because I work closely with Glossier as a brand ambassador and when I talk about the company, the short delivery time and amazing customer service is something that I always like to highlight. When I place an order with Glossier, I usually get a shipment notification within 24 hours and expected delivery date of 2-3 days later. I recently read this interview with the company’s Executive Director of Supply Chain Chain. Her role involves handling the physical production process with everything from development to warehouse. She works with vendors, negotiates costs and contracts, influences how much product to make and store and decide where to manufacture. I think companies like the ones you mentioned benefit immensely from technological innovations and automation in their supply chains, however, there needs to be a certain level of human touch and judgment in the process. These companies pride themselves on the quality of their products and thus the machines can’t just be ‘technically right’ when it comes to sorting, shipping, etc. The precision and complexity of these technological innovations are only as good as the makers who designed them. A hybrid of humans and technology is needed to create the best supply chain improvements. Especially for startup companies, there needs to be a point person within the company that understands the product, the customer, and the company mission in order to design a supply chain that fulfills all those needs. Thanks for your post! How neat that as an intern you got to see the warehouse for M.Gemi – sounds like a cool experience. As you referenced in your last paragraph, I am always amazed when I order items online from companies such as lululemon and Free People and have them on my door the next day. As we talked about on the very first day of class back in January, there are four core supply chain processes: supplier relationship (selection of materials, services, and information), new product development (design and develop new products and services), order fulfillment (activities to produce and deliver products and services to customers), and customer relationship (placement of orders and managing relationships with customers). Customers now expect their purchases to arrive on their doorstep within the next two or three days and order fulfillment and customer relationship supply chain processes are becoming increasingly important for companies to take into consideration. Additionally, the development of a time strategy (speed of delivery, response time, and consistency) is important too. Many companies haven’t nailed the order fulfillment and customer relationship supply chain processes yet and a new service, ShopRunner, is there to pick up the slack. I signed up to be a member a year or so ago and have loved the service. ShopRunner is a partnership of top retailers and brands who have joined together to provide unlimited free 2-day shipping on all of their products. Brands such as Tory Burch, Nieman Marcus, and Cole Haan use this service and ShopRunner essentially takes care of the order fulfillment supply chain process for the company while simultaneously making the customer happy by providing them with quick and free shipping! I really thought this was a fascinating topic to discuss. Warehouses are not something that I think about regularly, but this is such an important point you have brought up. In addition to hogging up the good locations, these outdated buildings are often too costly to renovate and bring up-to-date in technology, design, and practicality. These often inefficient factories once belonged to old companies, many of whom have long since past their prime years and have fallen out of business. With many of these factories left unused or abandoned, and with nobody willing to put in the investment to flip them, we are seeing prime real estate sitting vacant without a purpose. This is part of the reason that millennials have started turning cheap factory spaces into personal startups and hip restaurants. In cities like Durham, Cleveland, and my home city of Lansing, there are entire districts of old outdated factories being transformed into the Friday night destination for foodies and bar-goers. Even in Richmond, Scott’s Addition has sprung up from the ashes of old industrial parks. With these examples, I think we are seeing the industrial city spaces transition from places of production, to places of socializing. While this is happening, it seems that the blossoming companies are moving to or creating suburbs for their factories. Silicon Valley itself is an example of this. Firms are no longer pushing for what was once prime real estate in the city, but instead pushing outside the city where they can build their own larger and more up to date factories for the same cost. They are sacrificing some logistical convenience for this, but this also provides lower costs, higher quality factories, more lenient building code, and less negative impact on the community. Thanks for your comment. I found what you discussed to be extremely interesting and it got me thinking about my hometown, St. Louis. Cortex Innovation Community, an innovative district in downtown St. Louis, was designated the master developer to transform an old industrial district of warehouses, factories, etc., into a center for innovation and commercialization. They completely rebuilt and revitalized an otherwise dying neighborhood in St. Louis. According to Dennis Lower, President and CEO of Cortex, “Cortex is the region’s largest innovation hub, generating 3,800 tech-related jobs and over $500 million in investment in the last 14 years.” Companies and firms are increasingly looking to build their own unique and larger spaces instead of the traditional office building just as the Cortex Innovation Community did.